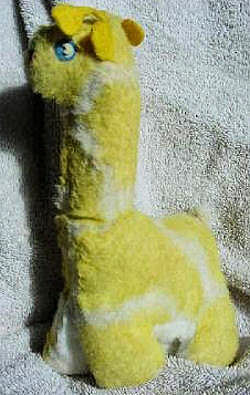 We still have a mailing list of people looking for this giraffe and another very similar to it. Hello, Rosemary. I am writing with a success story! I received the giraffe in the mail from Anne today, and it is just how I remember it. I hope that it is the way my friend remembers it too! =) I can’t wait until she sees it. Thank you for your help! My friend is pregnant with her first child. She has been talking about her first toy as a child, an Eden giraffe. The giraffe was the first toy that she received as a baby. Her father bought it for her. It was yellow and white. It did not have any fringe along it’s neck – just the two bumps on the head and eyes and ears. It was tall and slim – not one of the short plump versions of a toy giraffe you sometimes see. When it was wound up the toy played “You are my Sunshine” and the neck and head moved in a circular motion. The giraffe was her lovey throughout her childhood as her father battled cancer. He lost his fight when she was in the 6th grade and the lovey became even more important to her. Time went by and her mother felt she needed the support of her family. This meant selling their home and moving across the county. It also meant that many mementos of her father and her childhood were sold and given away to make the move easier. Her mother made sure that Dawna’s beloved giraffe and her baby book were packed safely away, so that she would have them when she grew up and was ready to start a family of her own. And she did have them…. 3 years ago she evacuated during Hurricane Katrina. She escaped to Texas to sit out the storm. She didn’t think to take her “lovey” and her baby book with her. Who would? They were lost, but her fiance and her mother were both fine. That was the important thing. Besides… she wasn’t ready for a family yet. I don’t know if the giraffe can be found. But, I would love to surprise her with it. Whats everyone doing for safety precautions for Halloween? My husband came across an article (http://i-newswire.com/pr220892.html) with some info about background checking neighbors. I thought that may be a little overboard, but it had some other good suggestions for some precautions I haven’t thought about. Last year my youngest son came down with a massive fever after Halloween. I almost thought about just taking the kids to our church’s fall festival this year instead of door-to-door to prevent that from happening again. I don’t know yet. What’s your advice? Am I over-reacting or just being a concerned mom? Our church sponsors a community wide Trunk or Treat with activities for the children, candy, and some sort of religious tract. We live in a rural area and this draws a crowd of about 600 each year. There are only 2000 in our whole town!! We just never took ours to a house where we did not know the people personally. We didn’t “do” much for Halloween, anyway, so it wasn’t a problem for us. Thanks for stopping by and I hope you stay to see if you can help someone find their lost lovies!! !